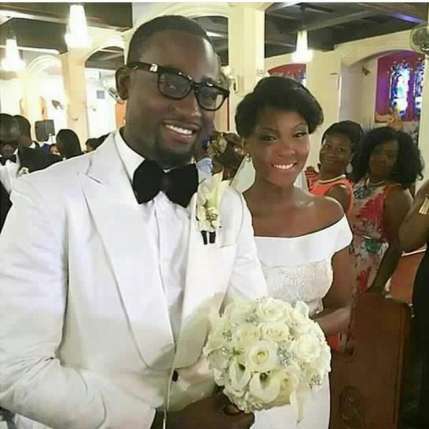 Newly wedded Tinsel star, Gbenro Ajibade has summoned up courage to shave off his 10-year-old dreadlocks for his white wedding! Ajibade who got heads turning when he appeared at his white wedding ceremony in New York with a neatly cut hair, to the admiration of many guests that attended the wedding. Sources close to the star, who became famous for his role as Soji in the M-Net series, say he shaved off his hair few days ago in New York after a long and carefully thought decision was made. ‘It was a long and hard decision because the dreadlocks has become part of his identity and he has grown so fond of the hairstyle and the look it gave him but he had to let it go few days before the wedding.’ Continuing, ‘Of course, he still had his locks on for his traditional wedding but he only shaved it off days before his wedding and a new beginning,‘ the informed source squealed. Ajibade, an actor and international model, started growing his dreads in Lagos in late 2005 and first showed up with it during a photo-shoot session for Tinsel as Soji in 2006. He has since had his dreadlocks until he decided to let it go in 2015 – just days before his white wedding. This Video of Comedian Seyi Law Performing With His 1-Year-old Daughter Tiwa is Everything! U guys did not tell us any reason why he did what he did. Of course,we know he must have thought over it. So what? !